Rebecca Salicki was ecstatic that her first Durham goal helped the Wildcats move third in FA Women’s Super League 2 with an emphatic 3-0 win against Aston Villa. 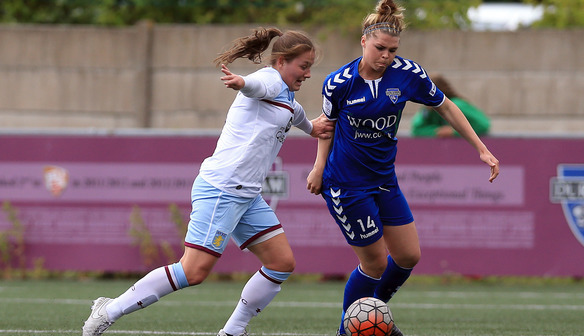 Sarah McFadden struck a first-half screamer as Durham made Villa pay for spurning several early chances at New Ferens Park. Villa dominated the early exchanges, and missed two fantastic opportunities in the first ten minutes with Katie Wilkinson missing an open net and Bethan Merrick striking wide with the goal at her mercy. Sarah Eadon, McFadden and Salicki all finished clinically to ensure Durham moved ahead of Everton and maintained pressure on second-placed Bristol ahead of next Saturday’s clash. And Salicki could not hide her delight after heading home in the second half. “I’m happy to get my first goal for the club. I didn’t think it was going in, but happy to get that one,” she said. “We have got that opportunity to score from all over the pitch which is a good talent to have. Beth Hepple blazed Durham’s first chance over the bar, but the Wildcats took the lead five minutes before the break as Eadon and Emily Roberts’ excellent interplay allowed McFadden to curl in a wonderful effort . Durham continued to press in the second half, Chloe Macek’s cross found Eadon inside the area, and her shot was deflected wide by Hannah George. But from the resulting corner, Salicki rose highest to head home and make it 2-0. Four minutes later, Durham captain Sarah Wilson thundered a volley against the crossbar before Eadon nodded the ball over the line as she too scored her first goal for the club. Aston Villa head coach Joe Hunt urged his side to take more responsibility in the wake of their loss. He said: “People on the pitch need to take responsibility and I felt some of them didn’t take responsibility. “We need to organise quicker, it can’t come from the bench all the time, sometimes players have step up. Durham (4-3-3): Helen Alderson; Ellie Christon, Sarah Wilson, Rebecca Salicki, Chloe Macek; Beth Hepple, Sarah McFadden, Rachel Lee; Emily Roberts, Sarah Eadon, Jordan Atkinson. Substitutes: Tyler Dodds for Eadon 86, Courtney Corrie for Lee 88, Megan Elliott for Hepple 88. Substitutes not used: Mercy Darkoah, Natalie Gutteridge. Aston Villa (4-2-3-1): Grace Moloney; Amy West, Elisha N’Dow, Lucy Porter, Hannah George; Katy Moran, Maddy Cusack; Sarah Mayling, Mollie Rouse, Bethan Merrick; Katie Wilkinson. Substitutes not used: Hayley Crackle, Robyn Tallis, Alys Hinchcliffe, Lucy Shepherd.